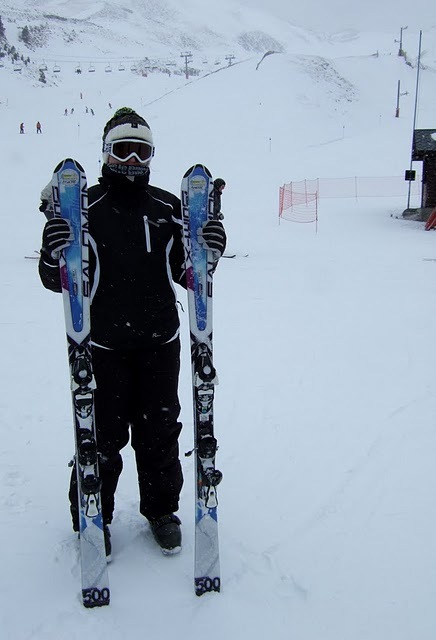 I promised a blog all about my first ski holiday, which I had last week. 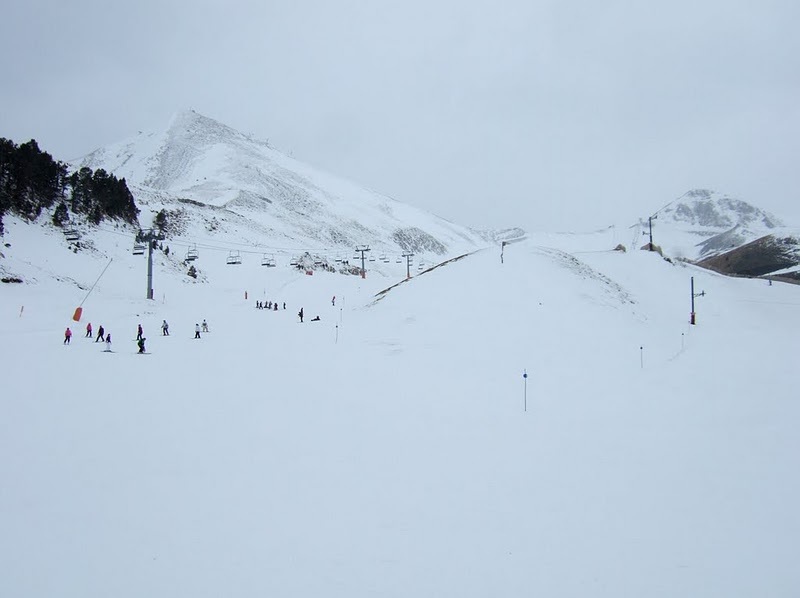 I went with my husband to Arinsal in Andorra for an adventure. 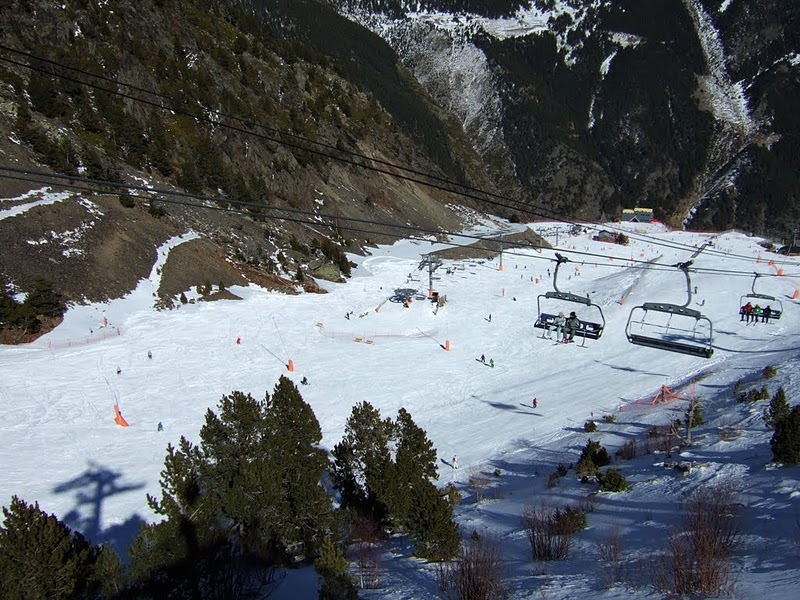 We picked Arinsal because it is supposed to be perfect for first timers and beginners, and the price was good. We were both nervous about the trip as, now both in our 30s, we had never done anything like this before – while we were very excited about it we were worried it would be stressful because we didn’t know what we were doing. Basically, the unknown bothers us, but we were really looking forward to doing something different. This whole adventure started when my husband went on a beginners ski lesson at Snozone in Castleford with some colleagues from work. 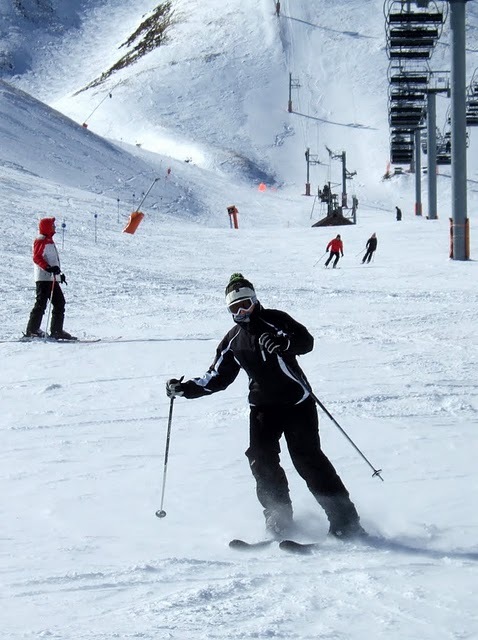 Although he struggled to stay upright he really enjoyed it, and one lunch time we ended up in Thomson picking up brochures and doing research into locations and such like, we decided yes, a skiing holiday would be a great idea. 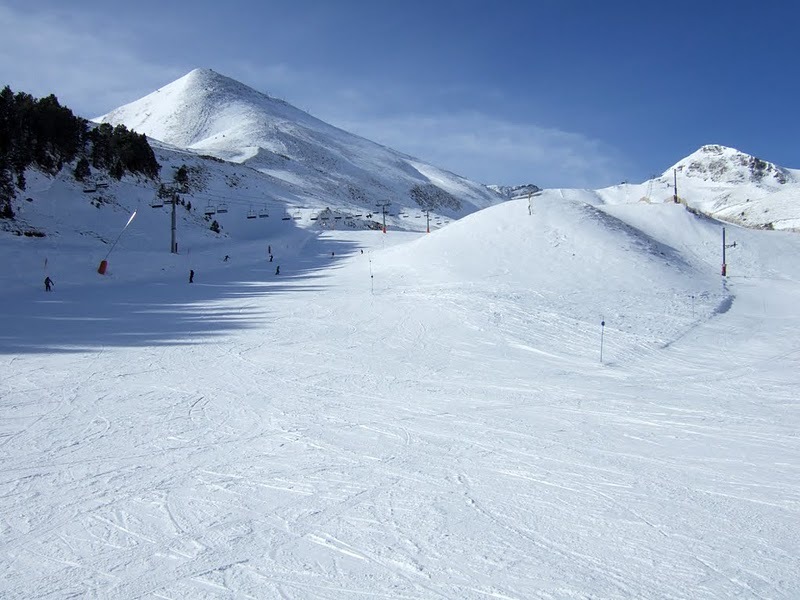 So I had a beginners lesson (this was back in August last year and the following week we booked a holiday with Crystal Ski (through Thomson) to Arinsal in Andorra. 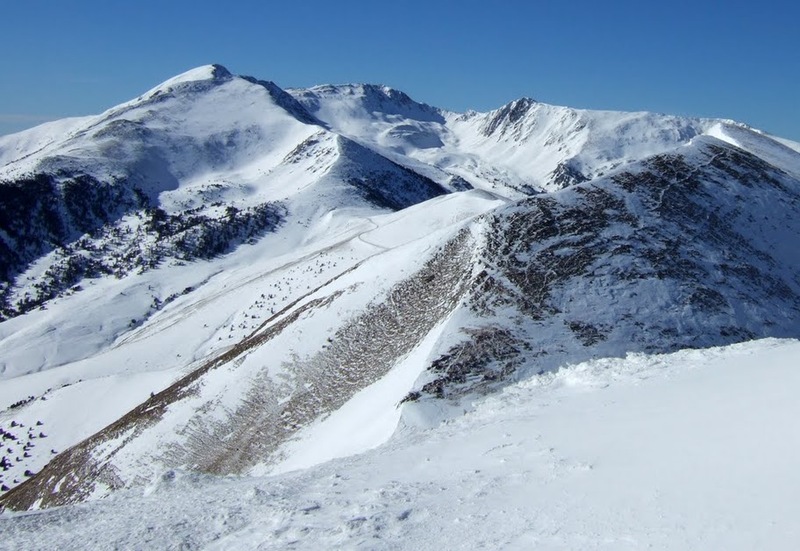 We were told by many people that Andorra was the perfect place to learn, and we were really happy to have taken the risk and booked to do something different. We had more lessons at Snozone with the intention of not being in the beginners group at Ski School (we booked the “improver” pack which included Ski School, lift passes and equipment hire) – we didn’t want to be spending the first couple of days learning how to put skis on. The lessons there went well, and we even managed a recreational ski session at Snozone the week before our holiday – just to make sure we remembered. Our day started with a wake-up call at 4am in the Courtyard by Marriott hotel at Gatwick airport. Travelling down the day before was definitely the best plan!! The hotel (park and fly) was good – rooms big and comfy, brilliant shower, and easy walking distance to the south terminal and then a short (free) monorail to the north terminal. We had checked in the previous afternoon so were able to go straight through security and it was quick enough. We took off at 6.50am and landed in Toulouse at 8.30am (9.30am local time) eating an interesting breakfast on the way. Mmm!! After we’d got our luggage we headed to find the Crystal rep and our coach. The journey through France and Andorra was a long one. We stopped at Foix on the way where the roads swapped from fast dual carriageways to a winding mountain route. I admit I had a short snooze and when I woke up we were high up – the views were amazing. Eventually we reached Erts, about 1.5km downhill from Arinsal and our home for the week. We stayed at the Hotel Palarine, a small British run hotel with 36 rooms. We had booked half board so hoped the food was good and varied – the reviews were good and the rep said on the way it was one of the best places to eat in the area. Our Crystal rep did the usual package holiday welcome and gave us our lift passes. We were impressed with the reps all week, they were approachable and knowledgeable as well as easy to find. After that we decided to walk the mile or so to up the hill to Arinsal. We had a look to see where the ski hire shop was and looked at the gondola ready for the morning, and popped into a supermarket for some water and snacks. The walk down to the hotel was much easier although the part with no path was worrying in the dark. From then on we got the bus up and generally walked back down (that hill is a good way to stretch the calf muscles after a day on the skis). Dinner was really good. Sunday night was a roast dinner buffet – I had beef, it was excellent, lovely and pink, and some rhubarb desert thing which was really tasty. Coke/sprite was €2 each and a 1.5litre bottle of water was €2.20, so the prices were good enough. If this meal was anything to go by we were not going to be worried about food for the rest of the week. There were two English channels on the tiny little television in the room – BBC1 and ITV1; the telephone had a wake up call option; the bathroom was large and had a bath with shower over; and there was plenty of places to put things. The room could have been improved by the provision of a more comfortable chair to sit on (rather than sitting on the bed) and of tea/coffee making facilities – but we were in Europe so hadn’t expected the latter. This is not going to be a relaxing holiday – but in a good way of course. Our wake up call was loud at 7am and we were at breakfast at 7.45am (when they started serving) ready to catch the 8.20am bus. Well the 8.30am bus – or whatever time they decided to turn up. First job was to get our ski rental stuff. St Moritz in Arinsal is the shop Crystal use so we trundled off there when we got off the bus. It’s like a conveyer belt… you get your boots, then your skis and poles, then they sort your bindings, then they scan everything and give you a receipt which you have to return at the end of the week (put this somewhere safe!). All seemed to go smoothly apart from Allister’s boots – they were too tight but the shop assistant insisted they were ok and refused to give him bigger. A few hours in them and his foot was completely numb – they were definitely too small! Skippy at the St Moritz shop at the top of the gondola swapped them to a different boot for him and at the end of the day we went back to the original shop to sort it out. That time the guy there was brilliant and found the right boots for him – I’m not sure why they didn’t listen in the morning and it caused Allister a lot of pain and stress, but at least we got it sorted by the end of the first day. Ski boots have to have a snug fit but losing the blood supply is a bad thing! Once we had our kit we headed to the gondola… Argh stress!! How do you carry everything?! I’ve still got no idea even at the end of the holiday! 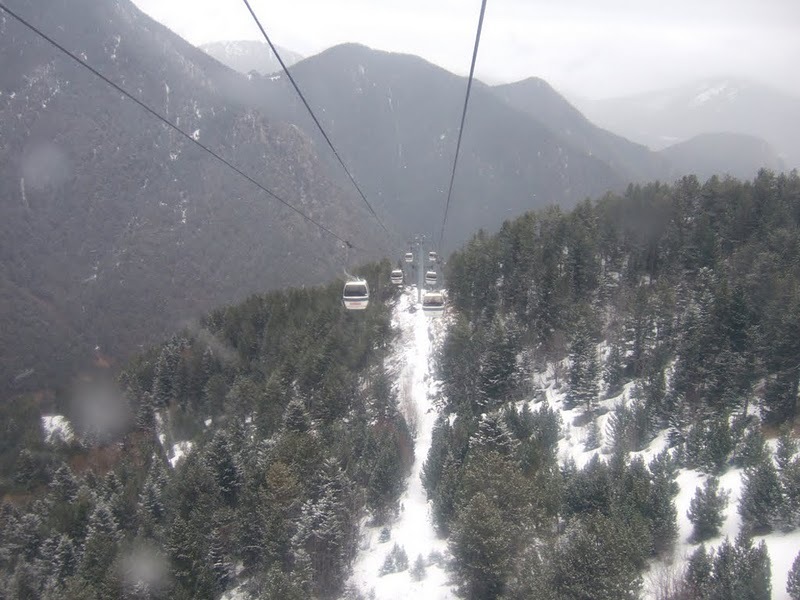 The gondolas are small (six people) and go up steeply to the base of the mountain. They might be a little scary at first but wow what a view!! At the top we decided to follow some advice we got online before we went away and went to the St Moritz shop (the same one that was helpful with the boots) and rented a locker for the week. This meant our boots and skis could stay at the top of the gondola for the whole week and so the journey to and from the base of the mountain would be much less stressful. It cost €54 for the week, and after just one day we knew that money was completely worth it. Both sets of equipment fitted in perfectly, the boots would dry overnight, and we had much more freedom when we came off the mountain to pop into a bar or a shop or walk back to the hotel instead of having to get the bus all the time. Ski School started at 10am on the first day. We put ourselves in the “advanced beginners” group (a level for those who’ve had lessons in the UK and so can snowplough but haven’t done much proper alpine skiing), and after a few “demonstration” runs down a small nursery slope in front of the instructors, we were put in the middle group within that level. We were in a group of about 12 with Ben who was our assigned instructor for the week. He spent time with us on the first day practicing basic techniques down the green run from the top of the magic carpet – an uphill travellator. Things went well, we got more confident and faster and are both feeling happy on the skis. On the first day they give you a break part way through your lesson, so we finished at midday and had another hour at 3pm. We had time for lunch, to get Allister’s boots sorted and do some more practice before meeting up with Ben and the group again. More fun on the little green slope during the lesson, after which we were both shattered so put everything in our locker and headed down the gondola into Arinsal, and walked back to the hotel. Dinner this evening was good again – a really good broccoli soup, a couple of different chicken dishes with homemade chips and mixed veg, and a desert that was tasty but not a clue what it was. Yum! All washed down with a couple of litres of water – we really need to drink a lot, not just the exercise but also the altitude. The hotel is quiet apart from the kids around the Playstation3, we were happy with our choice. Lessons from Tuesday to Friday were 9am to 12noon, so the 8.20am (ish) bus was the one to catch. We’re glad we are the first stop on the bus route as every day we left people at the next stop (St Gothard Hotel) because the bus was full – it’s only a five minute journey but it is steep and many people seemed to bring their kit off the mountain every day, and walking anywhere in ski boots is pretty impossible. Getting that 8.20am bus meant we had plenty of time to get up to Arinsal, go up in the gondola, get our ski equipment, and waddle over to the meeting point for 9am. It didn’t snow today but there was fresh snowfall overnight and Arinsal has plenty of snow cannons which lays the snow then gets mixed with the real snow to give a decent layer. Arinsal hadn’t had snow for about three weeks before we got there but we had loads during the week and I’ve just looked and it’s pretty much not stopped since we left. After a couple of warm up runs on the nursery slope we went up on the four man chair lift to the top of a long green run. We concentrated on our turns, gradually bringing our skis together into a parallel traverse. Then straight up on the six man chair lift where we had a choice of several blue runs and lots of routes down the mountain. It was a slow and steady run down, stopping at the Obelisk cafe for a hot chocolate on the way. It was a good lesson and we both felt much more confident – now we just need to practice, so after some lunch we went back up that chair lift and did the blue run several more times. I got frustrated with my knees, the first sign of any issues there, but thankfully they didn’t give me any problems the rest of the week. I fell near the bottom of my last run – my first proper fall, I was very annoyed with myself for that but I guess it’s inevitable and no damage was done. After we’d finished skiing we met Ben and some other members of the group in the Surf Bar to watch the video that was taken that morning – hilarious to watch but also very useful as it gave Ben a chance to really look at our position and style and give us tips on how to get those skis completely parallel throughout turns. We’d nearly got it… and were happy. There are many camera men on the slopes during the lessons, each from a different bar – take notice of the bar name on their bib and go look from about 4pm that same day to watch yourself in action! Our third lesson was lots of fun. We were up that six man chair lift over and over again. We had some more long runs with Ben in the morning and of course more skiing in the afternoon. We both really concentrated on bringing those skis together and we both managed parallel turns. We did some different routes down today too – there’s plenty of variety at the blue run level, which keeps things interesting. We had lunch each day in the Refugi, one of only two independent cafes on the mountain. Eating up there is not cheap but it’s not too bad. I mostly ate chips – I know, really bad for me, but I was using up energy fast and it’s what I fancied at lunch time. They also do various sandwiches and burgers. I think we spent about €10-12 each day on lunch between us but that was pretty much the only expense we had during the day. Apart from that while we were on the mountain we ate fun size chocolate bars we took with us thanks to a tip from a friend before we went (strange how they are fridge cold when they’ve been in your pocket up there for a few hours) to keep our sugar and energy levels up, and drank loads of water. Our last run saw both Allister and have pretty bad falls (although no injuries – phew) so we decided to stop – it’s when we’re tired we make mistakes. And of course in the evening we were spoilt for food in the hotel – it was the start of the theme nights at the Palarine, and the Italian food was just brilliant. The day started with some blindfolded skiing down on the short green run. How weird was that?! It was surprisingly easy to know where to ski – made the technique of putting weight on the correct ski really obvious; but it was also difficult because my sense of speed seemed to go with my sense of sight – I had no idea how fast or slow I was going. From there we were back up the six man chair lift for the long run down. We tackled a more difficult blue run at one point – it was narrow and had an odd camber which made it more difficult, but we did it fine (three times by the end of the day). We both felt confident enough to try anything that Ben asked us too and our skiing was improving every run. At the end of the lesson we even did a red run which was steep but fast and loads of fun – it was nice and wide so was an easy red but something conquered and it felt good!! In the afternoon, after a few of the normal runs we were used to, we were feeling up to exploring more of the mountain, so we went up the six man then down to the four man about a third of the way down, then up to very near the top of the highest peak in Arinsal. Wow what a view!!! Even in the heavy snow it was amazing. To get down we had the choice of two red runs and a black, as well as the blue we did. It was narrow and there was no “nice edge” like on the blues further down the mountain – just a drop!! Ben called it a purple because it was neither blue nor red, but it well within our capabilities. As the run turned the corner down the mountain it got really steep – much steeper than the red we did earlier but fine now we were parallel skiing. The runs nearer the base of the mountain now seemed a doddle, it did wonders for our confidence. The Chinese buffet is supposed to be the Palarine’s best night for food… and they weren’t kidding. Possibly the best Chinese ribs I’ve ever eaten. Seriously if you like your food then the Palarine is perfect! After the Chinese, because the buffet is open to the public and not just hotel guests, the hotel had an entertainer in the bar and then a karaoke. Oh dear oh dear… very loud and the singing after 11pm was er… interesting. But only one night so we couldn’t complain about being in a noisy hotel. Today was the last day of Ski School. We did two or three runs with Ben, including one from the very top (what we tackled yesterday). The snow overnight had left lots of fresh powder snow which was fun to ski on but did lead to my most impressive fall of the week – although it wasn’t my fault of course (!) but meant I was face first in deep snow and stuck between Emile (on our course) and Allister. None of us was hurt, was quite funny actually!! At lunch time Ben gave us our certificates – I have my Ski School Diploma and it says I can ski parallel – yay! Ben said that I was a fast learner and was skiing well, but now needed to pick up more speed and do more crazy stuff – ha ha!!! In the afternoon we obviously skied some more. The cold wind had frozen the powder snow of yesterday and some of the skiing was really bumpy and hard going. Allister fell badly at one point on a run that had been split in half by a fence ready for a race the next day – we stopped for a while then skied slowly to the bottom, calling it a day. No permanent damage done but a close call – his leg is still a bit sore now. We spent some time in the Surf Bar again with Ben and our Ski School group – it was nice to celebrate our achievements and thank Ben for his hard work with us during the week. I can recommend Ben as an instructor, he did a good job and has a really relaxed style which suited us perfectly (we were on holiday after all!). The theme in the hotel tonight was Indian… homemade Tikka Massala along with various other things – yummy! There was obviously no Ski School today but we decided to get the same bus at 8.20am working on the theory that most people would take the opportunity for a longer sleep and so expecting the runs to be less busy. We were on the chair lift when it opened at 9am and did six fabulous runs from the top of the six man by 11am. The snow at the start was clean and gorgeous and there was hardly anyone else around – we had such a great morning I would absolutely recommend getting up first thing on your last day to make the most of the empty runs. We sat at the Refugi for an early lunch and watched the world go by for an hour or so before doing one last run – the slope was super busy by then and it was difficult to find space for the long drifty turns we were enjoying, so we decided to stop and get ourselves and our kit back down the mountain before we ruined the fantastic day with a fall. We reckon we skied about 15km or more on the last day – no idea if that’s good or not, it seems like a long way to us beginners! We watched some kids, 8-10, maybe younger, take part in a downhill race for a while. We had the best view when we were on the chair lift but could see them from the runs too. Wow they were awesome – no fear. I guess that’s what happens when your Saturday morning club is on the mountain! We also watched some snowboarders to tricks and jumps – no idea who won the competition but it was fun to see. Thankfully getting the skis and boots down the mountain wasn’t as tough as getting them up (I guess we were more used to things in the end), and returning the equipment to the hire shop was very easy (as long as you have your receipt for them to scan in). After all that we went on the L5 bus to the capital of Andorra (Andorra la Vella). It was €5.90 return for the 20 minute or so bus ride. We just fancied a mooch – there were loads of shops but they all seemed to be selling either watches, cigarettes, sunglasses, electrical items or ski boots – it was strange how little variety there was. 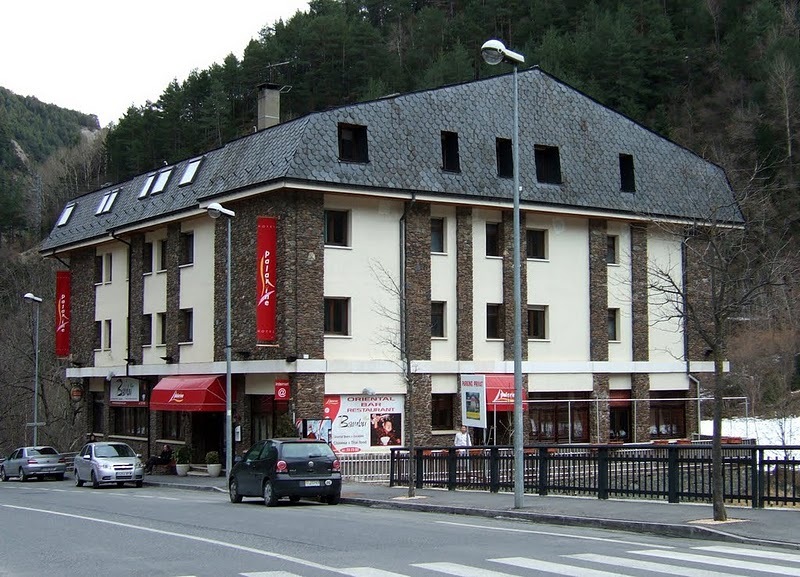 Tax is very low in Andorra so if you want to buy something like that then it’s a great place to shop. Oh, if you’re gonna take the bus to Andorra la Vella make sure you make a note of where you want to get back on the bus again… we must have walked around on a funny route as it took us a while to find our stop again when we wanted to return to the hotel! Our last meal in the hotel was Mexican night, and again it was awesome – absolutely no complaints about the food here at all. Oh, and the bar at the hotel had happy hour from 5-6pm which was 2 for 1 drinks, by the way. Not much to say about Sunday really apart from the 3.30am wake up call, 4.30am bus pick-up, long wait at the French border, 10.55am flight (all Andorra/French time), followed by a four hour journey home. We were both completely exhausted and there is an awful lot of washing to do, but we are so happy we picked a skiing holiday. I think the fact we’ve already ordered the 2011/12 brochure gives you a clue as to how much we enjoyed it – not sure how soon we’ll go back but we are definitely skiing again, we’re hooked! Skiing is a social sport so chat away to anyone who will listen! Thanks for reading my account… and if you have never been skiing GO!! !